An abdominal wall fat pad biopsy is the removal of a small part of the abdominal wall fat pad for laboratory study of the tissue. Needle aspiration is the most common method of taking an abdominal wall fat pad biopsy. The health care provider cleans the skin on your belly area. Numbing medicine may be applied on the area. 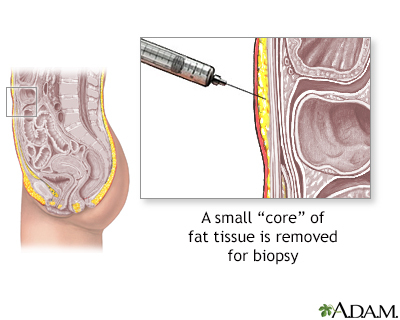 A needle is placed through the skin and into the fat pad under the skin. A small piece of the fat pad is removed with the needle. It is sent to a laboratory for analysis. No special preparation is usually necessary. However, follow any specific instructions your provider gives you. You may have some mild discomfort or feel pressure when the needle is inserted. Afterward, the area may feel tender or be bruised for several days. The procedure is done most often to test for amyloidosis. Diagnosing the disease in this way may avoid the need for a biopsy of an organ, which is a more difficult procedure. The fat pad tissues are normal. In the case of amyloidosis, abnormal results mean there is amyloid. 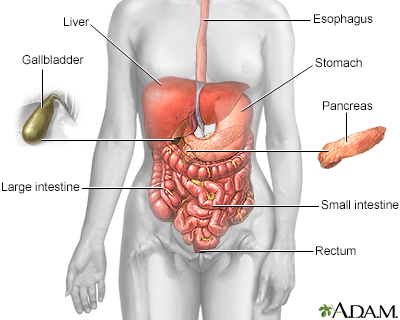 This is a protein that collects in tissues and impairs organ and tissue function. There is a slight risk of infection, bruising, or slight bleeding. Gertz MA. Amyloidosis. In: Goldman L, Schafer AI, eds. Goldman-Cecil Medicine. 25th ed. Philadelphia, PA: Elsevier Saunders; 2016:chap 188.